Or am I over-thinking it? 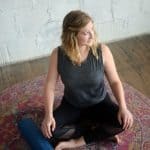 (Probably, I am a chronic over-thinker…) Like I explained in my post “Why I am Doing a Whole30”, I have jumped on this journey for a challenge, and mainly to see if eating whole foods with no added sugar (and other junk) can help some inflammation in my system, possibly balance my hormones, help my skin, etc. 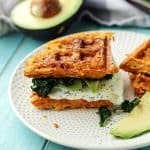 But without going into too much more detail on my Whole30 thoughts (that’s for another time) I feel like this waffle sandwich is alright… Or at least on my Whole30 journey it is alright. Maybe for someone else it will take them back to when they’d stop for McGriddles, causing some bad feelings around food. But for me, this is basically the same thing as having sautéed sweet potatoes and kale in a pan with my egg and avocado. I just needed to add some creativity to this go-to meal I eat all the time as to not get bored with it so I don’t end up crave something less “healthy” or more sugar or what have you. Alright, we’ve come full circle! Let’s chat about this recipe! 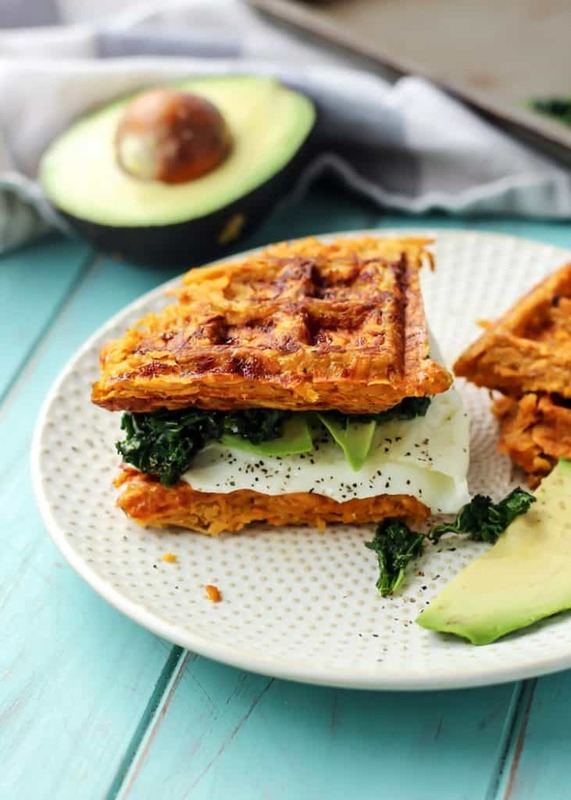 To make the sweet potato waffle, it’s not technically a normal waffle with all of the ingredients that would be considered SWYPO. It’s actually just grated sweet potato, a whisked egg, and some oil. That’s it! We’re not going full-on waffle style but making more of a waffle hash brown style, ya feel? 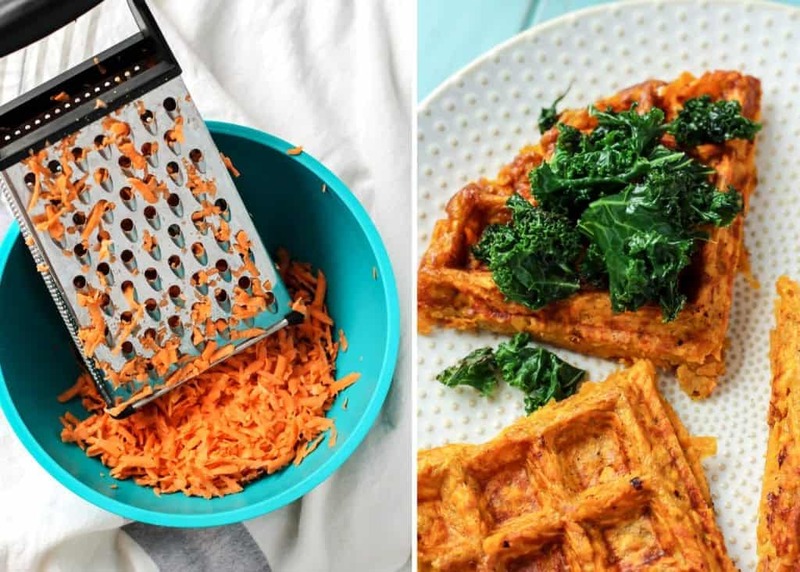 You then just pack all of the grated sweet potato in your waffle iron and cook until browned. While that is cooking, you can sauté your kale, fry your egg and slice up a little bit of avocado. It’s quite simple really. This meal would make a great “brinner” (breakfast for dinner) or a fun weekend breakfast/brunch. It’s so satisfying thanks to the good carbs, protein, plus the healthy fats from the egg and avocado. This meal definitely keeps me full! Grease the waffle iron really well so you don’t have pieces stuck when removing the waffle. 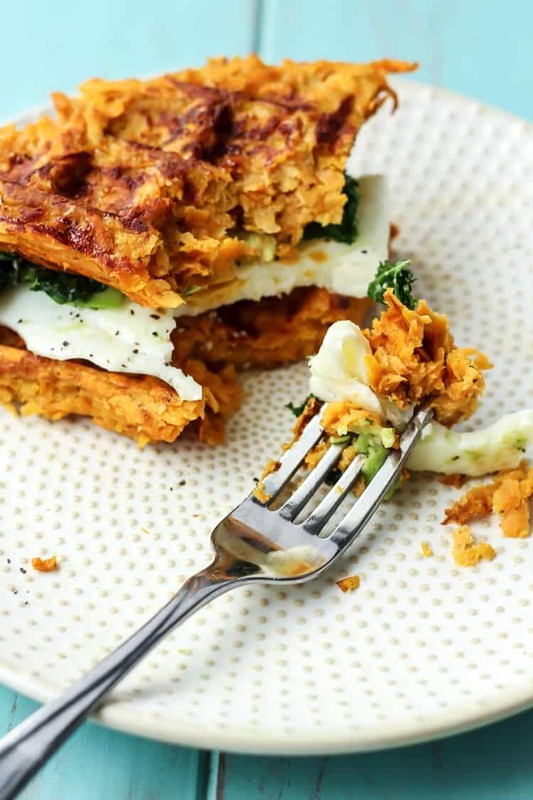 You will be packing the sweet potato hash into the waffle iron pretty thick. Don’t press down on the waffle iron so hard that your pieces end up getting stuck. I may or may not have had to test this process a couple of times, so trust me when I say this! Yes it’s worth that little bit of extra effort! Hi Jamie, I’m so sorry it didn’t work out for you! It could be a number of things, honestly. You do have to grease the waffle iron fairly well, and make sure the sweet potato shreds are packed in thick enough. And every waffle iron is different when it will be done, but *gently* lifting the waffle out with a fork is the best way to remove it. Again, I’m sorry it didn’t work out for you this time! Thanks for letting me know. By the color of the sweet potaoes in the picture …. It looks like you used yams instad, they have a lot more moisture than sweet potatoes. Hi Shaa, thanks for your comment! To be honest I don’t recall at this point, but you could be correct! You know I haven’t but I am guessing that would work out alright! Girl. Take all my money. This is like all of my wildest breakfast dreams come true. Also, I’m making your avocado pesto with zucchini noodles tonight and am sure it’s going to be delicious! Ah yay! 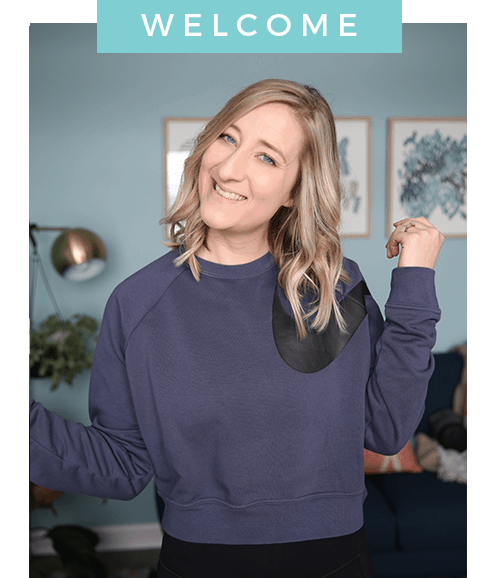 The Healthy Glow Guide has some awesome recipes I cannot wait to dig into! Um yeah it’s going to be on the menu ALL THE TIME. Thanks Rachel! HAHAHAHA I had NO IDEA that is what SWYPO meant. I’m dying. Holy crap. Anway, I’m not sure about the violation but at least you’re eating real food! And this looks friggin’ bomb. I don’t think this looks like it’s breaking the rules… It’s definitely keeping all the rules of deliciousness. Ashley, you’re becoming another wonderful resource for Whole 30 recipes; that’s one of the incredible blessings of you doing it. This looks SO GOOD!! And I totally know what you mean and overthink the whole SWYPO thing!! I think this is totally legit and I want to make it right now!! YUM! Haha glad you approve! Thanks Kelsey! YUM. I’d totally eat this Whole30 or not, but I need a waffle maker first 🙂 And I definitely have overthought the SWYPO thing, too. Like, I love cauliflower “oatmeal”, but is that too SWYPO to count? Ugh. I love your approach! I definitely think SWYPO is different for everyone, and there IS that gray area! Like they say a definitive NO to pancakes of any kind, but then “be careful” with dates and nut butter, so, I’m not sure. 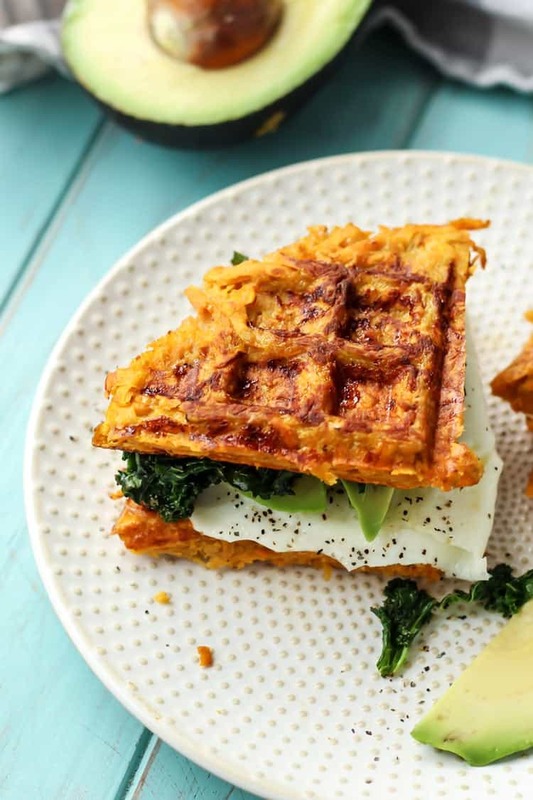 This totally looks like a fun hash brown type sandwich to me and I’ll have to dig out my waffle iron to try it out! Glad we’re on the same page Michele! That makes me feel better 🙂 Hope you can give this a try! All my favorite things together in one!! Oh man. I need to get a new waffle maker because this needs to happen. I use my waffle iron for way more than just waffles, but I have yet to make hash on it. I might have to test this out this weekend with either regular potatoes or sweet potatoes. YUM! I love that this recipe is SO simple. I bet it’s bursting with amazing flavor! All my favorite foods in one sandwich! I agree with Michelle above in that SWYPO is a personal choice thing. We all have our food vices and that’s what we should be trying to avoid. For me, anything that replaces oatmeal is a SWYPO because I love my oatmeal that much and everything would be a pale imitation for me! This recipe is totally not SWYPO on for me and holy crap, I am so making it on Thursday morning! More sweet potato = more happiness!! Seriously, cannot wait to try this next weekend!! I hope you try it out! It’s been such a hit 🙂 I can’t get enough of it myself too. Tanks Ester! I am so in love with these waffles! I just made a BBQ sandwich with them! So glad you enjoyed! And that BBQ sandwich sounds like an epic combo! Do I need to cook the sweet potato at all first? Yay so glad you were able to make them work! Cakes sound like a great idea 🙂 Thanks so much for sharing with me!! Just made these for lunch and were AMAZING definitely becoming a staple recipe from now on!! Yay so glad you love them! Thank you for your comment, Georgia! I wonder can you make the “waffle” on a George Foreman grill press or Panini Press? I only have a Belgian wafflemaker. I really dislike kale. Is there anything you can recommend that would be an excellent replacement? Thanks so much! Hi Theresa! You can definitely sub spinach or collard greens, or even leave it out entirely. Hope that helps! Awesome! So glad it worked out for you! Thanks so much for your comment Bea 🙂 I truly appreciate it! Made these tonight following the recipe to the tee and it was perfect. I made two waffles instead of one, and on the first one I loaded it a little thick on the outer edges so they fell apart a little but the second one I made sure to make the edges thinner and it worked perfectly. I have a little Oster iron and I set it to medium heat, using avocado oil. My sweet potatoes were fairly dry so I didn’t bother trying to squeeze liquid out. I also just turned the iron upside down onto a plate lined with paper towels instead of trying to lift the waffle out. Fell right out in one piece. Hope this info helps other readers! Thanks for a great recipe! Hi! May I know if the grated potato is cooked or not? Hi Sheryl! It is uncooked – I will add that note into the recipe page 🙂 Thanks for bringing it to my attention! Hi, I was wondering if you cooked the sweet potato first or just grated it raw? Thanks! Delicious!! Thank you! I am currently on Day 5 of my first whole30. Just what I needed 😊 Since I am a beginner in the kitchen and I discovered (again!) that my waffle iron and I do not get along, I will just make them like pancakes in a fry pan next time. Do you need to pre-cook the sweet potatoes?! Yummmy! I made them ‘open-faced” without the avocado simply because I didn’t have any, and used fresh baby spinach because it’s what I had) instead of cooking the kale. Will be making them again following the recipe when I have all the right ingredients. I think the trick to getting the waffles out without them following apart is cooking them until the edges are crisp. This turned out great! Our daughter tried hers with a little maple syrup on top and loved it! Lol glad we’re on the same page with SWYPO! I mean I totally get they “why” behind it, but if everyone followed that so diligently I feel like you wouldn’t be happy with what you were eating! But of course everyone is different. I hope you enjoy the curry! And this breakfast sandwich 🙂 Thanks so much for stopping by! Thanks for your great yummy breakfast sandwich recipe. The ingredients are really healthy, especially the sweet potato & avocado. The kids will definitely love it. Ok….I made this and it was PERFECTION and SOOO YUMMY….here is what I did differently. I actually baked the Sweet potato first. I then added the sweet potato (pure like), eggs, paprika and a dash of pepper. I heated my waffle maker really well and added olive oil to it. The waffles came out perfect!!! The only problem I am having with this meal is that it has a lot of calories, yes, they are good calories, but it just seems like a lot. Any suggestions as to how I can use less oil, or maybe a less calorie option? Hi Mari, You could also use less avocado, half egg whites and use oil spray instead of regular oil. Hope that helps! This was my breakfast and it was terrific….I don’t have a waffle iron so I used my Pizzelle maker and they came out perfect…I didn’t squeeze the water out of the potatoes the disks came out fine….what I was most impressed was being able to pick up the sandwich with my hands…it was flexible enough, I also added an almond remnants spread made with Nutritional yeast to give it a cheese flavor…Huge hit Thanks. So glad you enjoyed Bill! Thanks for your comment and feedback using the Pizelle maker, too! Hi Ashley, did you peel the sweet potato before grating it? Thanks! Yes, I did peel it first! I will clarify in recipe to update. Thanks! Super easy and delicious – the perfect dinner! Thank you! Made this recipe this morning. Followed the directions exactly and turned out great! I will be making this a lot on the weekends now. Thank you! Awesome, Jason! Thank you for taking the time to comment and leaving a review! 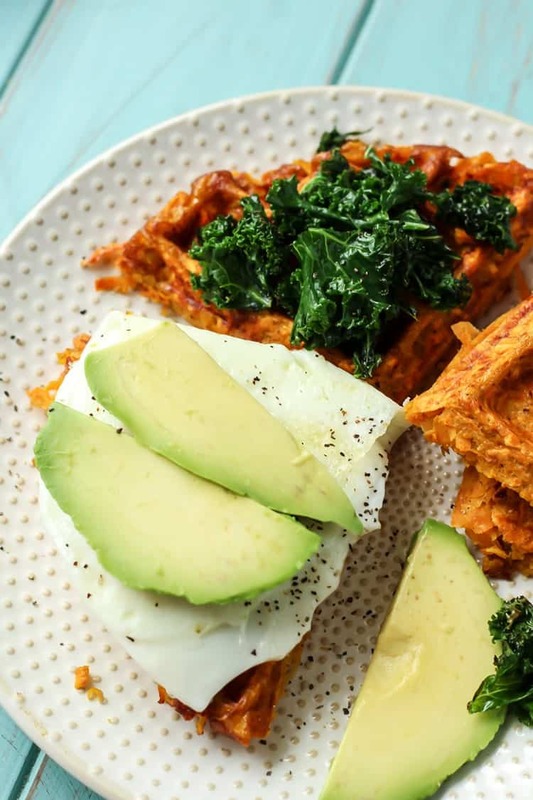 These look delicious but waffles are not Whole30 complaint just as an FYI. I’m a Whole30 certified coach. Can’t wait to try them in my Food Freedom though! I am on my 8th day of whole30 and this was exactly what I needed! SO delicious with no guilt! 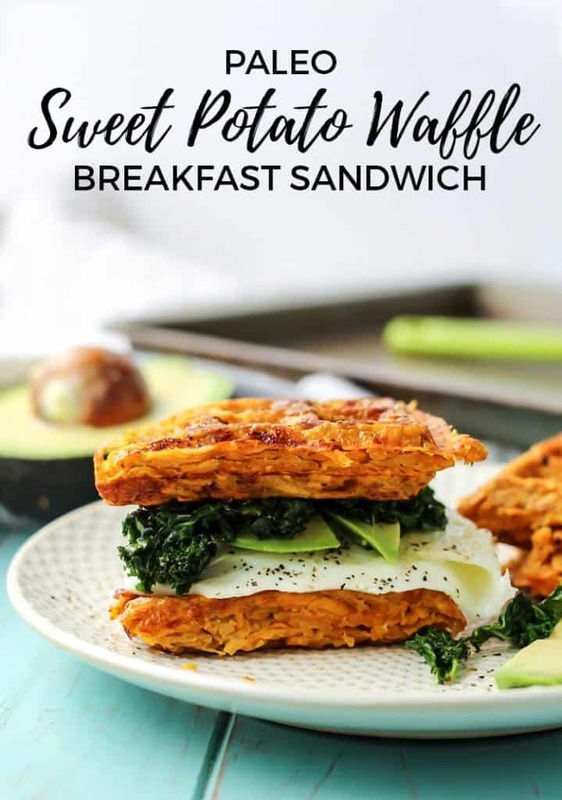 Although they are a “waffle” I don’t feel like it’s cheating because it’s literally just grilled sweet potato and egg. I followed your instructions and my waffle turned out perfectly. I think it would be easy to make a bunch and freeze them, then toast them later on. Thanks for sharing!! So glad you liked it Michaela! Thank you for taking the time to comment and leave a review! I was looking for some new breakfast recipes and I stumbled upon on this, OMG this is truly worth trying. Being a mother it’s really hard sometimes to make unique, healthy meal for your kids. Thank you! I made this as a breakfast “sandwich” and it was DELICIOUS. I would say omit the seasonings if you want something a bit more sweet, but I will add more garlic and cumin next time. I also might add more kale or spinach and some turkey bacon. This was so good!! As a kid I remember my mom making potato pancakes with leftover mashed potatoes. I wonder if that could work for sweet potatoes and if mashed might work in the waffle iron? Ever tried this? I haven’t tried this myself but I imagine it could! Have you ever created the waffles previous time? Was questioning if they’d heat up ok within the toaster? simply to save lots of a touch time within the morning. Yes they do reheat well. Readers often use this recipe for meal prep 🙂 Toaster or toaster oven is great for reheating. This looks so good! What a great way to eat a hearty breakfast and stay healthy! Thanks for sharing! Do they keep long or best day of? Yes they do keep well – about 3 days or so? Lots of people make these for meal prep. Best reheated in the toaster oven though!